I don’t claim to be a music expert, but I’m very passionate about it. I like what I like – it’s not all mainstream, so a lot of the bands on this list may be head scratchers for casual fans. That’s okay though, right? You may be learning about ten brand new bands! The one thing I noticed the most when building my list this time around is that there isn’t much variety. Sure, there’s one or two unexpected surprises, but for the most part, my top ten leans heavily in the punk and ska music genres. There were a lot of other types of music in 11 – 20, but I’m not going that deep this time around (sorry!). 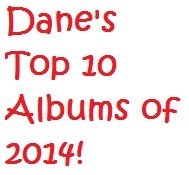 So, without further delay, here is my Top 10 albums from 2014. A list curated over hours and hours of listening throughout 2014. While I listened to lots of music last here, the list below represents what stuck with me the most. My awesome MS Paint logo for this blog post! I’ve been hooked on these guys ever since they opened for Frank Turner. The musical arrangements are pretty intricate given they fit in that punk – alt folk hybrid area. A lot of the songs on this album actually remind me of something Bruce Springsteen & the E Street Band would release. If you like Bruce Springsteen, punk rock, and The Gaslight Anthem, The Smith Street Band may just become your new favorite band. This album clocks in at 30 minutes, but it’s 30 minutes not wasted. Filled with a nice blend of quirky indie pop and emo, You’re Gonna Miss it All is a fast, fun, frenetic romp. While most of the songs are about relationships and lost love, it’s a blast to listen to. Slightly reminds me of older Get Up Kids. When it comes to the indie hip hop genre, Sage Francis is one of the best. I first learned of him when he signed to Epitaph Records and have been hooked ever since. Musically, the album runs the gamut from slam poetry, to fuzzy indie guitars to boom bap. Paired with Sage’s smart lyrics, it makes me wish there wasn’t such a gap in between releases. If you were to ask me in the beginning of the year about Die Antwoord, I wouldn’t know who or what you were talking about. I don’t even remember how they got on my radar, but once they were it was like a bad car accident – no matter how hard you try to look away you can’t. I’m hooked. I don’t even like techno, but there’s just something about the songs on Donker Mag that I can’t get enough of. When Vic isn’t fronting my favorite band of all time – The Slackers – he works on solo projects that let him explore some of his other musical interests. The Slackers are a hybrid of ska, reggae, rocksteady, soul, and dub. Those influences are scarce on Vic’s solo albums. Instead, you’re treated to folks, roots rock, and Americana. The songs are catchy and a lot of fun (and they help tide me over for the next Slackers album). It has been almost a decade since Lagwagon put out an album of all new original material. Their last album was mostly a tribute to the passing of their original drummer. A lot of has happened since Resolve, including the passing of Tony Sly. There’s a song paying tribute to Sly on here, but most of the album takes aim at society and how displeased the band is with the current state of affairs in the world. Hang just further solidifies Lagwagon’s place in the punk rock hall of fame. A lot has changed with Against Me! since their last album – including lead singer Laura Jane Grace coming out as a transgender woman. A lot of the songs on the album focus on dealing with gender dysphoria, but it doesn’t throw it in your face. The songs are catchy and well-written. While the band’s line-up changed multiple times during the recording of this album, Against Me! sounds reinvigorated on this album. The fact that this album came out in January 2014 and is still in heavy rotation says a lot for me. Deal’s Gone Bad are equal parts Jamaican reggae and Motown soul. Not bad for a bunch of guys from Chicago. It’s the kind of music that just puts you in a good mood. Another thing that this album does is translate the energy and joy of seeing Deal’s Gone Bad live. Such a great album! 2014 was the year for lots of punk and ska vets to return with new music. The return I was most excited about was Santa Barbara’s Mad Caddies. I’ve loved this band since seeing them play in front of a school bus at the 1998 Van’s Warped Tour. Their sound has evolved immensely since then. Just like the food this album is named after, their music is a mixture of many elements. You’ll hear lots of punk and ska, but there’s an overarching flavor of ragtime, New Orlean’s jazz, Beatles pop, dixie, and dancehall. It’s eclectic, but the kaleidoscope of styles make for a very interesting listen. Plus, this album gets major bonus points for being one of the most requested albums in the car by my four-year-old daughter. This is the album (and band) that I listened to the most in 2014. Again, this is another album from a veteran band with a long span of time since their last proper release. With such a long time between release, you expect a level of ring rust or sense of feeling dated. This isn’t an issue with Metropole. Instead, it becomes TLA’s maturest album to date. Brendan Kelly turns in his screaming for melodic singing, and the songs are filled with an almost somber and introspective reflection on getting older. 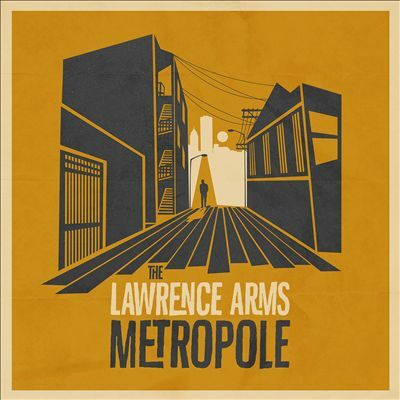 As someone who grew up with The Lawrence Arms (and Slapstick before), Metropole is an album that is easy for someone in their mid-thirties to relate to. It’s weird to call a punk rock album beautiful and poetic these days, but Metropole is that in spades.